Egypt parliament speaker Ali Abdel-Aal said the proposed amendments to Egypt’s 2014 constitution, which will be put to a vote in parliament tomorrow, will not be the last. 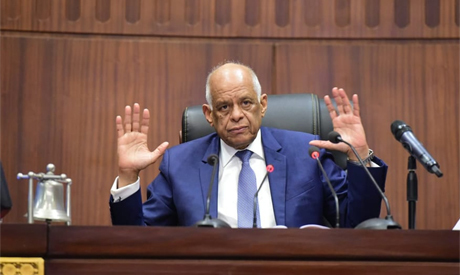 “In fact, Egypt will need to write a new constitution within the coming 10 years in order to go in line with changing political and economic conditions,” said Abdel-Aal. Abdel-Aal also indicated that he and a lot of MPs affiliated with parliament’s constitutional and legislative affairs committee had rejected a proposal that would allow President Abdel-Fattah El-Sisi to run for office until 2034. “There were a lot of divisions among MPs on this point, and we rejected the proposal of some that the sitting president be allowed an additional 12 years [in office] till 2034. “I mean that the constitution still maintains the two-term limit and prevents elected presidents from staying in power forever,” said Abdel-Aal. In its meeting on Sunday evening, parliament’s constitutional and legislative affairs committee voted in favour of amending 12 articles of Egypt’s 2014 constitution. The committee approved that the new parliament, which will be elected at the end of 2020, be composed of 450, and that women will be allocated 25 percent of seats (112) in this parliament. Parliament will vote Tuesday on the constitutional amendments, which will also reinstate the post of vice president and recreate a second house of parliament.